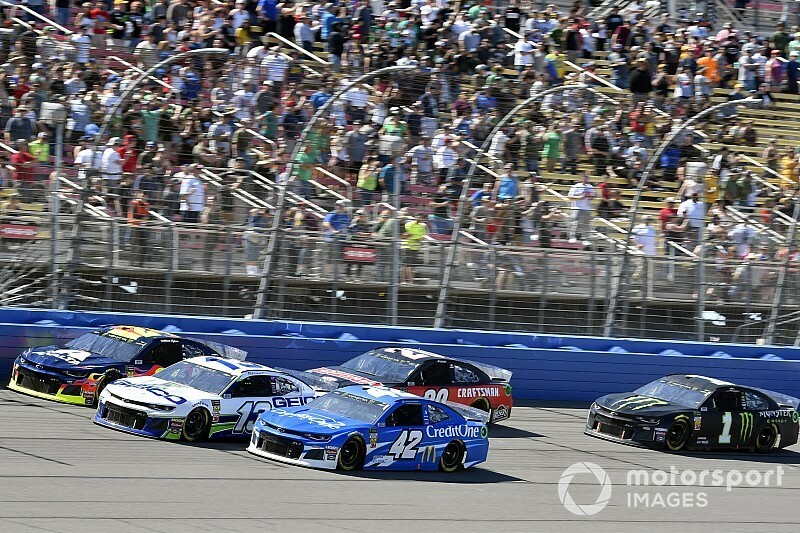 What do you think is the most important takeaway from the first four races of the season utilizing the new aero package? Jim: I actually have two. The first is, the package should have been run in a race last season to see how it performs in true race conditions. 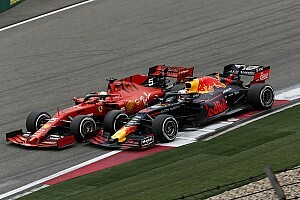 No matter what simulation you use, you cannot replicate the actions and decision-making of 39 other drivers (and their teams) in race conditions. We've seen it time and time again. The only way to do that is to actually do it in a real race - a race where there are real consequences and real stakes on the line. Even if you had a test with 40 drivers, you would not get a real indication because there is nothing of consequence on the line. And the second: There has been much too much made of the package thus far when a lot of what we've seen has been long green-flag runs with green-flag pit stops and few cautions in races. No matter what package you use, the field gets strung out the longer a green-flag run goes and especially when there are green-flag pit stops (because everyone is not pitting at the same time). Nick: I am concerned after seeing it at Fontana, a track I thought it would be the perfect fit for. The racing on restarts was exceptional, but after a few laps it became a slower version of the same thing we've seen in the past. Mind you, I don't want or expect pack racing, but the package has definitely not delivered. But I expect them to make tweaks and hope to see some better results in the months to follow. Tim: My biggest takeaway is that just too soon to judging the package. There have already been several variations of the rules package and I think there were some strides made that NASCAR had hoped for - more green flag passes, etc. - I just think it’s just too soon to really judge it. I must admit after the first stage at Las Vegas I was really worried, but I feel the second and final stages of the race were much better. I think we’ll know better maybe by the end of July. 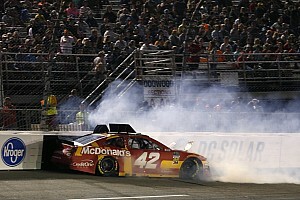 Kyle Larson usually is in the mix to contend for a win on 2-mile tracks like Auto Club Speedway. How surprised were you that he was never a factor at all last weekend? Jim: I've been very surprised Larson has not been more up front this season in general, and especially at Auto Club Speedway. In his very short stint at Ganassi thus far, Kurt Busch has clearly been the most consistent performer (and also the top running Chevrolet in general a lot). It would be easy to say that perhaps Ganassi, like a lot of other Chevys, were a bit behind on running with the new aero package, but it would seem if Busch can be in the mix, Larson should be as well. Nick: It's strange because CGR isn't struggling. Kurt Busch has been running strong since the get-go and I am genuinely surprised to not see Kyle Larson right there with him. There's certainly something amiss with the No. 42 so far in 2019. Tim: The biggest surprise to me overall this season has been how Kyle Larson has performed so far and how well Kurt Busch has adjusted to a new team and car. Busch has been the highest performing Chevy driver at many of the races so far this season and Larson’s struggles at Auto Club really surprised me last week. I really thought based on his previous races there this could be a coming out so to speak for Larson but it never developed. NASCAR Trucks return to action this weekend at Martinsville Speedway. Do you expect a veteran to win or one of the young up-and-comers like Harrison Burton to surprise everyone and get a win? Jim: Well, Kyle Busch is entered and another Martinsville clock could be ready for the claiming for NASCAR win No. 201, but we've seen some surprises of late at Martinsville and this has been a good track for Daytona winner Austin Hill. Nick: With Kyle Busch in the field, I doubt it will go another way. He will be tough to beat and I wouldn't beat against him. Tim: I would like to see a younger driver win and it could happen, but with Kyle Busch entered I must admit I expect to see Busch record win No. 201 this Saturday at Martinsville Speedway. How important are short tracks to the NASCAR Cup Series and if you could bring a short track back to the Cup Series, which one would it be? Jim: Short tracks are clearly important because they were the backbone of NASCAR when it first came into existence. Fans also like them because they immediately put drivers on top of each other from the get-go and leave little room for error. I don't think it's plausible to bring back a former short track in any way shape of form. What I would rather see is a track owner construct a new short track from scratch that includes many of the amenities for fans you now see at places like Daytona and Phoenix that have been recently remodeled. Honestly, that's the only way more short tracks (other than more races on the ones that are already being used) will happen. Nick: Well, short tracks remove the need for all this aero package debate. It's going to be refreshing this weekend at Martinsville with a break from all that talk. I'd bring ten short tracks to the Cup level if I could. As for bringing one back, I don't ever see it happening but North Wilkesboro tops my list. But there are plenty of great short tracks around the country that would work just as well. 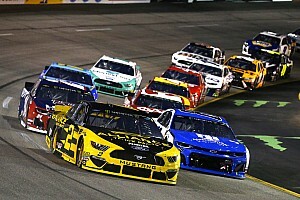 Tim: I think short tracks are the backbone for NASCAR and still almost anyone who is anyone is anyone in the sport cut their teeth on a short track and they will always be a vital part of the sport. For me, I would love to see North Wilkesboro come back and like Jim mentioned above, a track with all the bells and whistles expected at a track now by fans and competitors might be best served with SMI or ISC building a new track from scratch. Opinion: Can Stroll ever silence his harshest critic?